My Polish Grandmother used to make these for us all the time while I was growing up and then my Dad continued to make them after she was gone. They always make me feel at home wherever I have them and I definitely consider them a comfort food. While I was living in Greenpoint, Brooklyn for a year there was a huge Polish population and we had a great deli nearby where you could get these for $1.25/ea. and they tasted just like my Dad and Grandma used to make. Jenn didn't used to like them too much but they have grown on her and she said this time around were the best she's had (I've only made them twice). They are a lot of work but they can feed a lot of people for very little money and re-heat very well. Traditionally, they are made with rice and ground pork as the primary ingredients for the stuffing but at some point my Dad switched to orzo pasta instead of rice and we've never looked back. The orzo is never as dry or rigid as the rice can get. The secret to the sauce seems to be condensed tomato soup and chicken broth. We've tried all sorts of other combinations but they never taste as good. I did try and get the low sodium chicken broth as I know both those ingredients can be very high in sodium. You can probably use low sodium tomato soup as well. You start off by cooking your orzo very al dente (since it will continue to cook later in the crock pot). Then you rinse it with cold water to until it's completely cool to the touch and then you can start to mix it in a large bowl with your ground pork, garlic, scallions and bread crumbs. I also cooked half of my bacon ahead of time and crumbled it into the mixture as well. My Dad always used to lay it over the stuffed cabbage while it was cooking (to flavor the sauce) but I thought it might be nice as part of the filling and it was! The next step is to steam your cabbage. I don't have a great method for doing this or removing the leaves once they are done. I basically soaked my oven mitts while doing it... Maybe a dish towel instead? The best advice I can give is to cut the outside of the veins of the cabbage leaves and to core it initially too to help the leaves fall off more easily when they are done steaming. They should basically be soft and pliable. Then you simply wrap them as if you were wrapping a burrito and place them in the crock pot with the open end facing down so they stay wrapped. As you fill the pot with these, before starting a second layer, cover them all with some chicken broth and your tomato soup. You want to ensure that each one has some sauce to cook in. Once you have either exhausted your ingredients or filled your crock pot, cover it and bring it to a boil initially. Then you can lower the heat and just let them cook for a couple of hours or so. The longer they go, the better. They are very filling and great for large groups. My brother and Dad were visiting when I made this batch and they both seemed to like them! It's certainly one of my favorite family recipes and this batch was definitely the best that I've made. 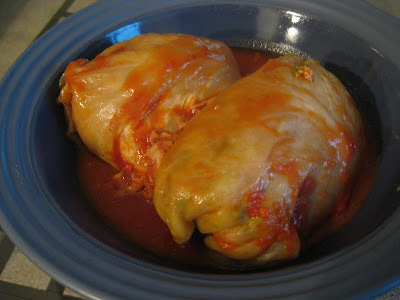 I love cabbage rolls, I used to work in a cafe that made really good ones. But I think the switch to orzo is inspired, I really like that idea! I LOVE galumpkis. This reminds me of my Poppy's recipe!